The Gaia-Wind 133 is one of the most productive small wind generators in the world. The table below outlines an energy comparison of various manufacturers generators, in this instance, eligible for the UK Feed-In tariff. All the above data is based on publicly available Microgeneration Certification Scheme (MCS) data. MCS data is independently tested according to strict protocols and offers a true like for like comparison of small wind generators. The most important factor in assessing the performance of a wind generator is the swept area. This is the size of the area covered when the rotor blades turn – the bigger the blades, the bigger the swept area, which results in more energy produced. 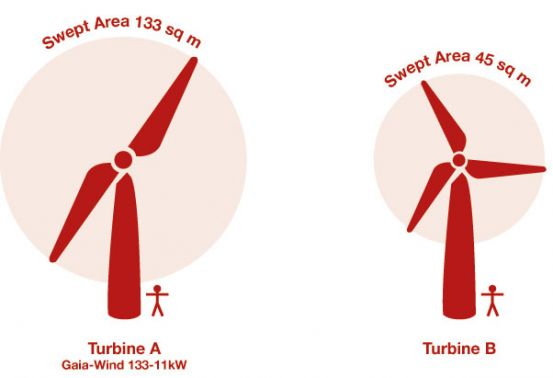 The GW133 wind generator has a swept area of 133m², compared with the swept area of similar sized turbines which are less than half this figure. In recent tests conducted by the US Department of Energy’s National Renewable Energy Laboratory, the GW133 wind generator outperformed its nearest competitor by a factor of more than 2 to 1. A Gaia Wind small wind generator producing 30,000 units of green electricity per year, will offset around 17 tonnes of CO2 emissions. This is sufficient to erase the carbon footprint of the average 4 person household. Contact us at info@gaia-wind.com to find out how much energy your site could produce with a GW133 small wind generator.